When I heard Ronald Shaich, Executive Chairman of Panera Bread, say “bring your humanity to work” recently, it suggested a way of operating that could make corporate crises a thing of the past. That comment has rich implications for ethical leadership and building corporate culture so that an organization flourishes. It also speaks to the impact business can have on society, which is what Shaich meant. The impact raises questions about the deeper definition possible for the term “corporate responsibility”. Bill Gates has raised the bar on how businesses can leverage their competencies and use financial success to address social problems globally. He and others have recognized that governments are not going to solve the world’s problems. Shaich indicated that business needed to step up beyond writing checks and donating goods. In Panera’s case, donating about $150 million a year in food wasn’t making a difference in impacting the one in four children in the United States struggling with hunger; an issue Panera cared the most about. Listening to a news story about a small Colorado cafe that served the poor, he got an idea. Building off what Panera does best in over 1,450 communities in North America, the company did research and tested business models and locations. The goal was to develop a sustainable, pay-what-you-can community cafe concept and convince shareholders the idea made business sense. They called it Panera Cares. Panera created the Panera Bread Foundation which launched three nonprofit cafes serving the full menu in communities that have both poor and affluent residents – Clayton, Missouri; Dearborn, Michigan and Portland, Oregon. They created a model of shared responsibility where everyone is treated with dignity and those who can pay more do in order to cover the cost of others. It was a risk Panera tried to mitigate by taking small steps, learning, and improving on the concept. 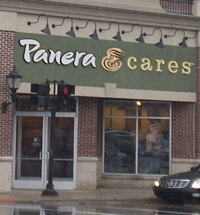 When Panera opened the first community cafe in St. Louis in May 2010, Shaich worked with employees and volunteers the first two weeks to iron out any issues. The second community cafe launched six months later, and the third, this past January. The results? Nearly 12,000 people are fed each week in the three cafes. Panera found that shared responsibility works. About 20 percent of customers leave more than the suggested donation, 20 percent leave less or nothing, and 60 percent pay the suggested amount. About 75 – 80 percent of the retail cost of the food is covered. There is a donation bin in place of a cash register. Dealing with hunger isn’t just about food, it is also about jobs. In St. Louis, Panera has begun a job training, work/life skills program for at-risk youth and expects the program will roll out in the second cafe this summer. Panera isn’t over-promising; it just keeps taking steps to leverage what they know how to do to impact hunger and at-risk youth. At a TED conference last November, Shaich invited attendees to imagine a world where a company like Wal-Mart handled food distribution for food banks, or banks like J.P. Morgan and Bank of America were as worried and involved in the people getting foreclosed, and how to avoid foreclosure, as they are in doing the foreclosures. Or imagine, he added, a world in which the outstanding management talent at companies like Ford and GE were applied to the enormous responsibilities NGOs face all over the world. The reality is that the definition of a company’s stakeholders has changed; they are now all of society. The impact of a constantly shifting global economy, and the inter-relatedness of problems in one part of the world impacting the rest, take away the firewalls leaving us on each others’ doorsteps. Panera’s entrepreneurial approach — working a plan that makes business sense, taking small steps, creating shared responsibility, and providing a sustainable outcome — might be a model for others who are looking at corporate responsibility more narrowly. It is about taking what a company can do well and transferring it to a situation that meets a critical social need. The possibilities are endless. Imagine a world where we bring our humanity to work. How much easier it would be for organizations to earn and keep trust and reputation. Gael O’Brien is a Business Ethics Magazine columnist and a thought leader on building leadership, trust, and reputation. She also writes The Week in Ethics, a weekly column where this article was first published.